Dear readers, having observed and analyzed political situation from a young age to date, does not make me a genius in my writing, but I believe this must set out to be motivation for anyone who believes in the power of contribution to nation issues through God-given talents such as my writing. And in this episode of 'Focus on Zambia 3.0', we shall discuss the games of thrones and other elements that has characterized the Zambia political scene ever since the death of His Excellency Michael Chilufya Sata. 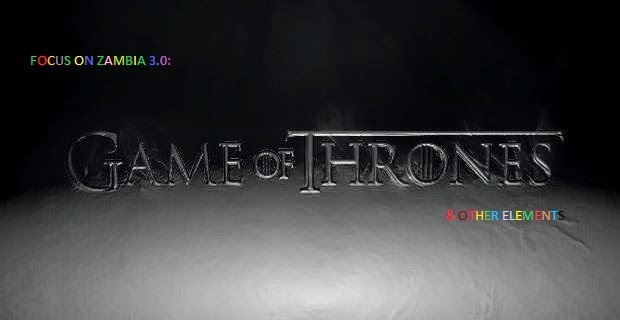 Furthermore, I believe it will be wise enough to discuss the topic of 'games of thrones', but looking at each political party separately before giving out a generalized opinion. Currently, these are the political parties in Zambia, even though most of them are unknown because most of them being 'One-man party', therefore to name the key players we need to include the ruling Patriotic Front (PF) and the main opposition which are United Party For National Development (UNPD) and Movement for Multi-party Democracy (MMD) While ADD, NAREP and FDD also play an important role. To shade light on Zambian political system and its funding to those who are not familiar with it, please observe that political parties funding is characterized by the following; lack of public funding of political parties, dependence on personal wealthy by members, well-wishers or donors and no regulation on how much to be spent on campaigns, which is hard for some parties to contest elections. Unlike other countries that sponsor political parties, Zambia's late President Levy Mwanawasa opposed to the motion of 'state sponsorship of political parties' in 2005 when it was brought into debate in Parliament. And below I will highlight more on the 'Games of thrones’ through examples in relation to the current state of affairs, though not all political parties are mentioned. Dear Readers, the decision to skip some parties in this article is not as a sign of favoritism or discrediting any political establishment, but it is done to focus on the theme of our article which is 'Games of throne' or 'Inner party fighting' and the author of this article is 'non-partisan'. The Patriotic Front (PF) the 'crème le crème' of Zambian politics, turned out not to be the best, because when they were in opposition the champed a movement that seemed visionary and focused on fighting corruption but it turned out the 'crème le crème' were caught in their own web of confusion fused by unprofessionalism and shortsightedness. And the is no doubt, that the is a leadership crisis in the ruling party and this can be observed through the ill-mannered they conducted themselves after the death of His Excellency Michael Sata and the indiscipline, they displayed I believe will follow and haunt them during their candidate adopting process. Despite the current confusion the Patriotic Front as the ruling party stands a better chance of re-election, but if the party infighting continues then the 'crème le crème' of Zambia will be defeated at the polls and will go down in national history as the visionless, if not order less party that fought and caused its own death like a headless chicken. In focus on Zambia 2.0, I wrote about the rumored Rupiah Banda comeback and if am not mistaken I recommended the former head of state to remain in retirement so that he paves way for a new breed of leaders, but I think Mr. Bwezani is a man of his words because his comeback to politics displaced the MMD's president Pastor Nevers Mumba leaving the party divided. With the theme of our article in mind 'Game of thrones', I believe you can agree with me that MMD 's leadership confusion is somehow an exposed point of weakness that leaves it unstable and wounded. Zambia's political cycle will never be the same, though I pray that the political curse of Zambian which is the spirit of ‘forgetting fast' will be broken in the next elections set for the 20th of January 2015. As for the inner part fights, I believe political parties have to iron out they inner conflicts before under estimated inner fights turns into a national crisis. And for the voters, vote wisely MOTHER ZAMBIA needs true leadership and that true leadership can be chosen in the next election, remember your vote is your choice and strength.